Automatically open and close OTAs like Booking.com and Expedia based on your criteria. Save on commissions when you do not need them. 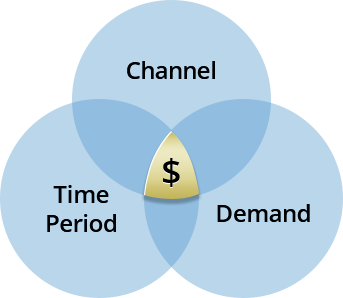 Raise or lower your rates based on time frame and occupancy in order to maximize revenue. Automate complex rate decisions accurately and immediately. Yield Management will implement the right price at the right time based on your strategy. Like another business there are two sides to the hospitality business. There is the public side or the hospitality side and the business side or money side. Unlike most businesses, as we all know, what you do not sell today is gone tomorrow. What most hoteliers do not do is sell the maximum number of rooms at the maximum leveraged price. It is not a third party bolt on. Calculations and triggers are done instantly and immediately implemented in the PMS, your booking engine and across all OTAs. It works deep into the OTAs. This means that if the OTAs, like Booking.com and Expedia support it, you can close out or open up specific promos, all promos or BAR automatically based on your criteria. So if you want your seven day advanced closed because you are at a high enough occupancy, Yield Management will close it and leave the rest of Booking.com open. No need for you to go into your extranet and close it out. Incredibly easy to use and setup. You can setup multiple tiers and rules for each time period which allows to easily see your strategy evolve. Reports and breadcrumbs. Each reservation that comes is that is effected by a Yield Management action is marked. This allows your front desk to understand the reason for rate differences. Affordable. Check the pricing page.